Two Air Force pilots granted whistle-blower protection have said publicly that they refuse to fly the F-22, which has been plagued by oxygen problems. Eleven F-22 pilots have suffered hypoxia – oxygen deprivation – in the cockpit since September, and five maintainers have complained of similar symptoms, a spokesman for Air Combat Command said. The Air Force says it is pulling out all the stops to hone in on the problem, and has physiologists, doctors, engineers and others looking for a solution. In other news, about 150,000 Air Force personnel including civilians and contractors are expected to go through the Air Force’s rifle qualification course by the end of the year. Instituted six months ago, the course is meant to better simulate the up-close and personal combat situations that airmen find themselves in these days. Airmen learn how to field-strip and reassemble their rifle or carbine, clear malfunctions, and shoot while moving. 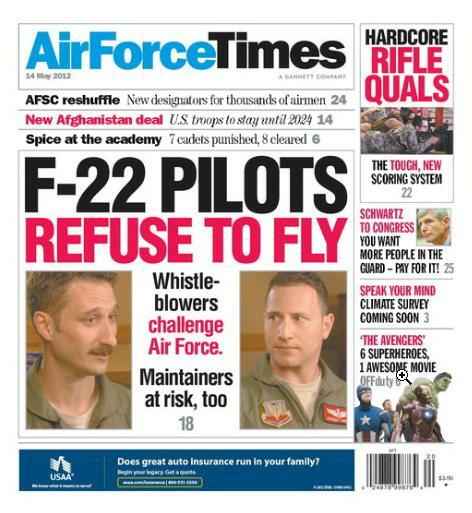 And more than 6,400 officers and enlisted airmen are affected by the latest changes to the Air Force Specialty Codes, which became effective on May 1. It was not immediately known if any of the changes require airmen to retrain, reclassify or change their jobs. Isn’t a shame that after flying aircraft for nearly 100 years we now have an oxygen problem.. The manufacturers can not find the problem. First question, what did we change? Think it is that simple to find, but not solve. Do we have an Edsel type of system? Why are we now having problems when the last aircraft is rolling off or has rolled off the assembly. Shame on you project engineers for putting our Airman in jeopardy. Retired AF maintainer.